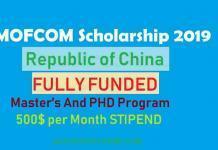 The Chinese Government Scholarship is now accepting applications for HEC Xi’an Jiaotong University Scholarship For Masters & Ph.D. Program from Pakistani students. 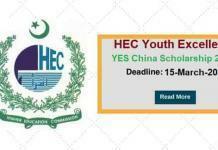 Higher Education Commission HEC Pakistan invites applications from Pakistani/AJ&K nationals for Master’s & PhD scholarships programmes offered by Xi’an Jiaotong University, China in the academic year 2019-20. Xi’an Jiaotong University is a top ten university in China with a history of over a hundred years. The University is located in Xi’an, the ancient city, which boasts many famous tourist sites. Xi’an Jiaotong University XJTU is a key state university that operates under the administration of the Ministry of Education of China, well-known for its highly qualified teaching staff, outstanding students, modern facilities, and its beautiful campus. In order to promote a better understanding and friendship between Chinese and people from other countries, XJTU welcomes international students to apply “Chinese Government Scholarship” for graduate studies. Comprehensive Medical Insurance and Protection Scheme for International Students in China. The successful candidates will avail exemption from tuition fees, and living stipend (standard to be decided by Xi’an Jiaotong University) during their respective study programme. Applicants must be Pakistani/AJ&K national & dual nationality holders not eligible to apply. Applicants for Master’s degree must have a Bachelor’s degree (16years) and be under 35 years of age. Applicants for Doctoral degree must have a Master’s degree (18 years) and be under 40 years of age. Applicants may not be in receipt of any other types of scholarship currently. Applicants for Ph.D. program must have some research achievements. Apply online at HEC E-Portal(Link is given below). After successful submission of the application, get its two printed copies signed by yourself. Apply online at online XJTU Application Form for International Students (Link Given Below). 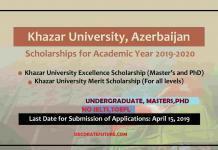 Submission of XJTU application form and online HEC form is mandatory. In case of missing any of the both above -mentioned forms the application will not be entertained. The applicants must make sure to submit online application form at HEC online portal and Xi’an Jiaotong University online portal. HEC will shortlist candidates to donor agency for final selection. In case of shortlisted candidates copies of all educational documents and attested copies of CNIC, B-form, Domicile, IBCC equivalency certificate and HEC equivalency in case of foreign degree qualification must be submitted to HEC. A study plan or research proposal (800 words for Masters & 1500 words for PhD), copies of any research publication, language proficiency certificate or IELTS/TOEFL results, copy of valid ordinary passport (first two pages), attested copy of medical certificate from a Govt. hospital, will also be required from shortlisted candidates. The forms with incomplete records or without the signature of the attending physician, the official stamp of the hospital or a sealed photograph of the applicant are invalid. Please select the appropriate time to take physical examination as the result is valid for only 6 months. Two academic references from last institution attended in Chinese or English language. A Study Plan or Research Proposal: Applicants must submit a written study plan or research Proposal in English or Chinese, with a minimum of 800 words for Master degree and 1500 words for Doctoral degree. Certificate of English/Chinese Proficiency Level: Finally nominated candidates by HEC will be required IELTS, TOEFL or GRE as per Xi’an Jiaotong University requirement.